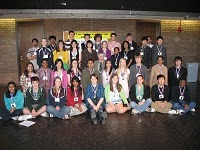 The 1st Annual Vermont Regional Brain Bee was held on February 13th, 2010, at UVM in Burlington. There were 11 student participants from three high schools from HInesburg, Bristol and Middlebury. This event was sponsored by the VT Chapter of the Society of Neuroscience. The oral section of the competition where students were eagerly answering questions presented by Rachael Hannah, a UVM anatomy and neurobiology Phd student. Students from Champlain Valley High, Mt. Abe HIgh and Middlebury Union High Schools, teachers, and committee members. 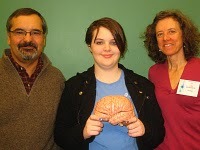 2010 VT Brain Bee winner, Sarah Longchamp, senior, MUHS, is surrounded by Paul Scaramucci, Advanced Biology teacher, and Lisa Bernardin, Vt Brain Bee Coordinator. The 2010 National Brain Bee happened on Friday, March 19th and Saturday, March 20 at the University of Maryland in Baltimore and at the NIH site in Washington, DC.